Octavia Spencer is an American actress and author who has won three awards including an Oscar, a Golden Globe, and BAFTA for Best Supporting Actress for her role in The Help. After decades of minor movie roles in Hollywood, Spencer became the only black actress to receive two consecutive nominations, as well as one of two black actresses, nominated for three Academy Awards. As an author, she has published a number of children’s book series since 2013 including The Case of the Time-Capsule Bandit, Randi Rhodes, Ninja Detective among others. With the aforementioned accolades, let’s get to know a little more about Octavia Spencer. Octavia Lenora Spencer was born on May 25, 1972, in Montgomery, Alabama, United States. She was raised by her parents among six siblings but lost her dad at the age of thirteen. Her mother, Dellsena Spencer worked as a maid before her demise in 1988, when Octavia was just 16 years old. She studied and graduated from Auburn University at Montgomery with a degree in English as well as a double minor in journalism and theatre. Growing up Spencer was diagnosed with a reading disability medically known as dyslexia. Before making her film debut as a nurse in A Time to Kill, Spencer started off as an intern on the set of The Long Walk Home. Following a steady trend of minor movie roles, Octavia Spencer featured in films such as Spider-Man, Big Mammo’s House, Never Been Kissed, Bad Santa and more. Following her brief appearance in the drama film, Seven Ponds which brought her media popularity, Spencer got enlisted among the 25 Funniest Actresses in Hollywood by Entertainment Weekly in 2009. The Help became one movie which Spencer’s feisty and unflappable role as Minny Jackson made 2012 a memorable and overwhelming year of prestigious accolades. She won the 2012 Golden Globe Award, the Academy Award and a BAFTA for Best Supporting Actress – all in one movie. The Academy Award was her first win in a first time Oscar nomination and Spencer was practically moved to tears during the acceptance speech following a standing ovation at the ceremony. 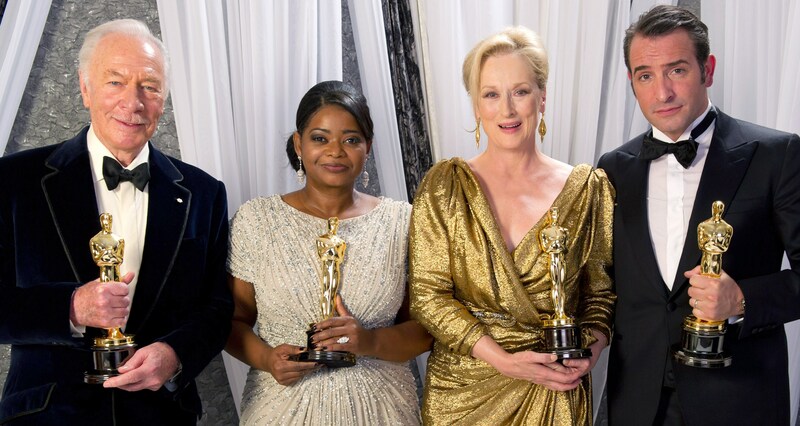 The same year, Octavia Spencer got an invitation to join the Academy of Motion Picture Arts and Sciences. From 2013 to 2015, she actively played major roles in films such as Fruitvale Station; Get On Up; Red Band Society; Black or White; Divergent Series: Insurgent. She also lent her voice as an otter, in Disney’s Zootopia, which was her first animated film. In 2016, she landed another award-winning role in Hidden Figures where she played the mathematician and human-computer Dorothy Vaughan. For her outstanding performance, Spencer won a Golden Globe Award, a Screen Actors Guild Award as well as a nomination for the Academy Award for Best Supporting actress; it would be her second nomination but not the last. For her portrayal in the fantasy drama film The Shape of Water, she got nominated for awards including the BAFTA, Golden Globe and her third nomination for an Academy Award – which made her the only black actress to follow up an Oscar win with an Academy Award nominations. Octavia Spencer has been an active actress who has featured in over one hundred movies and television, thus has sustained a steady and substantial income of $75,000 per episode of her latest movies. Her net worth is reportedly $12 million but it didn’t just come on a platter of gold. During her appearance on the Hollywood Foreign Press Association talk show on the theme: ‘Women Breaking Barriers,’ the beloved actress disclosed that it was fellow actress and producer, Jessica Chastain who helped her earn more money on a new film. According to Spencer, while she and The Help costar were discussing the pay disparity between male and female actors in the movie industry, Chastain got to learn that such was also the case with women of color; they earn less than the white actresses. In tear-filled eyes, Spencer said Chastain made her a pledge to join forces and help her, as well as other African-American actresses like Jada Pinkett, make that amount. Who is Octavia Spencer’s Husband? Thanks to her fame, fabulous social life, family, and friends, the actress seems happily married to her career. Like some celebrities, Octavia Spencer is intentionally or unintentionally single and doesn’t have a husband or kids yet. Besides having few close male friends like Tate Taylor, She is often seen outdoors, unescorted and all smiles. See Also: Hilary Duff Husband, Divorce, Age, Height, Son, Where Is She Now? Spencer has always been seen as the cute and chubby award-winning actress and while she isn’t looking to be one of the size 2 celebrities, her weight loss journey has been a priority. She was the spokesperson for Sensa, a brand of dieting product that aid weight loss, before the deal went awry. Nevertheless, she was able to attain 68kg and losing 20 pounds as she attended the Screen Actors Guild Awards in 2012. Also, a report said the Oscar-winning actress had gastric bypass surgery in 2005 – a medical procedure that reduces tummy size in order to curb the quantity of food the patient eats.